The Slik Clamp Head 32 can slip, and lock onto a 5/8" light stand or grip top. 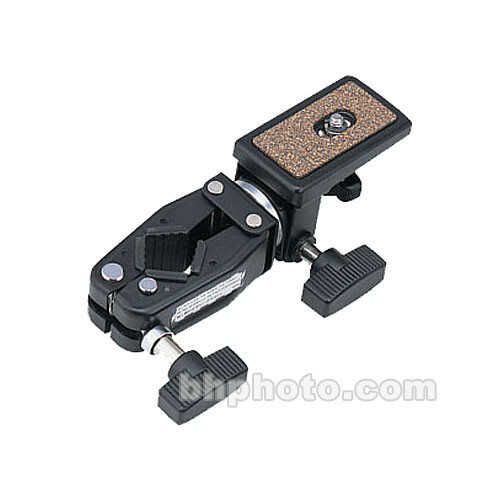 It has a cork-base platform with a 1/4-20" threaded lock knob for a small light fixture or camera. The platform has a locking swivel mechanism. Box Dimensions (LxWxH) 11.0 x 6.4 x 2.7"
Clamp Head 32 is rated 5.0 out of 5 by 2. Rated 5 out of 5 by Pete from For overhead food shots It works perfectly for what I wanted to do, overhead food shots. Rated 5 out of 5 by Patrick from Well designed and solid construction Well thought out, with versatile positioning. What is the weight capacity of this clamp? Will it hold a bridge camera such as the Panasonic FZ series? The weight capacity of this clamp is 4.5 lbs so it could essentially hold a Panasonic DMC FZ1000 which weighs only 1.83 lbs.